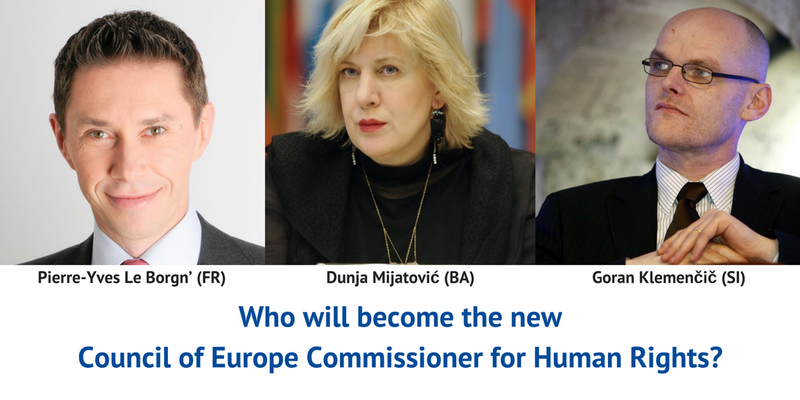 On 23 November, the Council of Europe Committee of Ministers submitted a shortlist of three candidates for the post of the Human Rights Commissioner to the organisation’s Parliamentary Assembly. Mr Goran Klemenčič (Slovenia), Mr Pierre-Yves Le Borgn’ (France) and Ms Dunja Mijatović (Bosnia and Herzegovina) became the top pre-selected candidates. Tomorrow the Human Rights Sub-Committee of the PACE Committee on Legal Affairs and Human Rights will interview the shortlisted candidates and will address a recommendation to the Assembly’s Bureau in this respect. Unfortunately, the selection process is limited to the Council of Europe institutions leaving no opportunity for the civil society to express an informed view as to the relative suitability of the candidates for this key position in the Council of Europe’s human rights architecture. In an attempt to challenge the status quo, the EaP CSF addressed a questionnaire to the three candidates. It includes seven questions allowing to make an informed assessment of the candidates’ priorities and strengths in the field of human rights. Dunja Mijatović and Goran Klemenčič have already accepted the invitation to reply to the EaP CSF Steering Committee by 22 December 2017. The new Commissioner will be elected by the Assembly during its winter plenary session in Strasbourg (22-26 January 2018). He/she will replace the incumbent Commissioner Nils Muižnieks as of 1 April 2018. The new Commissioner would be the 4th person to hold this position. Mr Muižnieks (Latvia) was elected on 24 January 2012 and took up his position on 1 April 2012. He was preceded by Sweden’s Thomas Hammarberg (2006-2012) and Spain’s Alvaro Gil-Robles (1999-2006). The Commissioner for Human Rights is an independent and impartial institution established in 1999 by Council of Europe to promote awareness of and respect for human rights in the 47 Council of Europe member states. The Commissioner is elected by the Parliamentary Assembly by a majority of votes cast from a list of three candidates drawn up by the Committee of Ministers, for a non-renewable term of office of six years. The candidates are supposed to be eminent personalities of a high moral character having recognised expertise in the field of human rights, a public record of attachment to the values of the Council of Europe and the personal authority necessary to discharge the mission of the Commissioner effectively. The office closely cooperates with national human rights structures, leading human rights NGOs, universities and think tanks.